Irish coach Brian Kelly and Notre Dame are a win from the title game. 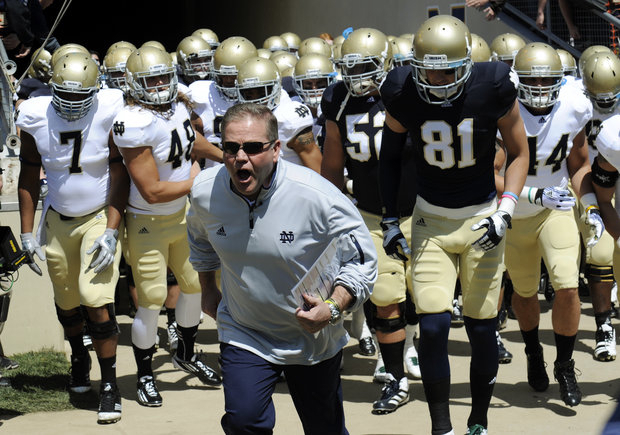 Notre Dame coach Brian Kelly has led his team to a #1 ranking. Today is a day of left-overs, Black Friday specials and plenty of sports news. You can sit on your couch for hours this weekend with high school and college sports, the Bears and the Bulls. What a dandy way for top-ranked Notre Dame to finish the regular season: playing at USC. When the college season began, the Trojans held the top spot of the polls. I guess the saying, "It&apos;s not how you start, but how you finish," is really true for the Irish. They better be careful, though. The Number 1 spot has been very wobbly —just ask Alabama and Kansas State; both posted losses as the top team. Notre Dame coach Brian Kelly&apos;s team is 11-0, if they finish with a "W" Saturday in California. January 7th will be their next playing date in Miami for the NCAA crown. How many people predicted them to be there? While I wouldn&apos;t want to be in Tim Beckman&apos;s shoes, I&apos;d gladly slip into Northern Illinois head coach Dave Doeren&apos;s sneakers. He has the Huskies make the Top 25 rankings this week, with a 10-1 record and 21-4 the past two years. His quarterback, Jordan Lynch, is having a record-setting year. Another bowl game and another win there. NCAA Athletic Directors will be courting Doeren to fill a bigger, renown head coaching jobs. What is his shoe size? There will be championship football in Champaign this week-end — it&apos;s high school, but at least it&apos;s exciting. In 8A, Glenbard North meets Mt. Carmel; in 7A, Glenbard West takes on Lincoln Way East. Cary Grove and Crete-Monee vie for the 6A crown and Montini faces Morris in the 5A match-up. Who has more emotions in these outcomes, the players or their parents? On the professional level: The Bears need to re-group for Sunday&apos;s meeting with divisional opponent Minnesota. Quarterback Jay Cutler may or may not at the helm; we’ll see if this team can get their offense on track. Or did MNF shellshock this team? The Bulls are still trying to find their identity without “you know who.” Tomorrow they end the long road trip up I-94 in Milwaukee. The Bulls are getting a new practice facility next to the United Center; DePaul is in play with either a new arena or free play at the UC. I wonder what the Cubs are thinking? When will Mayor Rahm Emanuel and the North Siders get on the same page about Wrigley renovations? The weather may not conjure up thoughts of ice skating, however. Four of the city&apos;s seven lots, including the one at Wrigley Field, will open late this year. Maybe there will be a Ronnie “Woo Woo” sighting when it finally opens Wednesday. Charity work is part of most people associated with sports and one of the biggest hearts can be found at Halas Hall. Twenty-four years ago, Bears equipment manager Tony Medlin began a coat drive. Now, he and the Bears have partnered with Jewel-Osco stores to collect thousands of new and gently used coats. Donations are being collected in boxes at Jewel-Osco stores. These coats are given to the Salvation Army and to Chicago-area public schools. Since today is a day to look for bargains, the local baseball teams are making some reductions in ticket prices. The White Sox have a real bargain for families on Sundays. All 13 home dates have huge reductions on tickets ($5-$15 available) and parking has been reduced to $10. If this doesn&apos;t sell tickets, it will be hard to figure what else they can do — except win. And that wasn&apos;t enough most of last season when they were in first place. Leftovers, football, basketball and shopping. . . what more could you ask for?